Isaiah Thomas has been through the tough times of trying to make a roster, suffering major injuries and dealing with demoralizing trades. He’s also endured the heartbreaking losses of his sister and, more recently, his grandmother and a close friend, rapper Nipsey Hussle. Through it all, Thomas has stood tall. Now, after returning from a major hip injury with the Denver Nuggets in February, Thomas is hoping to rise again as a star player in the NBA. Although he has averaged only 8.1 points and 15.1 minutes per game in 12 contests for the Nuggets, the former All-Star remains confident in his abilities and is hopeful he’ll be able to showcase them during the playoffs. Thomas talked to The Undefeated about his return to the playoffs, his friendship with Nipsey Hussle and his feelings for Boston in the following Q&A. You recently returned to Boston for the first time after the Celtics traded you in 2017. Was there some closure that you received when you were welcomed warmly? The trade still hurts. I feel like it was still wrong. I understand the business and things like that, but how it went down and what I gave for that city, I felt like it was wrong to do that. But with time passing, you understand the business, you understand what’s going on, and I was just upset at that moment. I feel like, like I told people in Boston, if I wasn’t hurt and I was able to hoop right away, like when I got traded, it wouldn’t have been that big of a deal because I would be able to do what I love. But I had to sit out seven months after that, so that was tough for me. But that moment in Boston was everything. I needed that, with everything I been through, everything I’m going through. That was genuine love. You can’t dream about things like that. That was real. The Nuggets are a talented team with limited playoff experience outside of Paul Millsap and yourself. Why should we believe in this team? I believe in us because I’ve been around it every day and I see our talent. I see what we can be. For anybody else, they’re not going to believe it. I’ve been on the No. 1 team in the Eastern Conference and they didn’t believe in us for years. I understand that. Nobody’s gonna believe in us. We have nobody that’s on this team that has a big role, other than Paul Millsap, who’s been in the playoffs and done that. We’re going to be counted out, and hopefully all these guys expect that because then we can shock the world. What will it mean for you to get back onto the playoff stage? Everything. I’m comfortable on that stage, so it’d mean a lot to be able to get an opportunity, a real opportunity, to go and showcase what I can do and how I can help this team. ‘Cause I know a lot of these guys haven’t experienced that stage yet and it’s tough, it’s different from the regular season. But if my name gets called, I’ll be more than ready to put on a show, for sure. 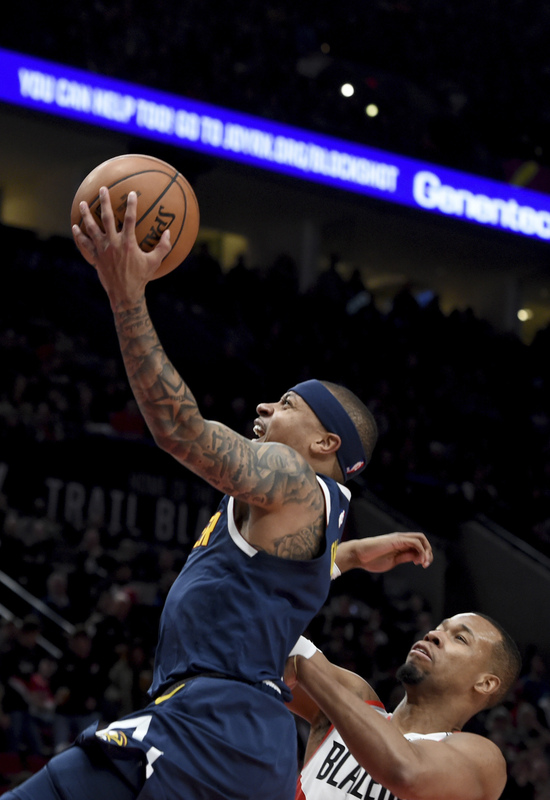 Denver Nuggets guard Isaiah Thomas (left) drives to the basket on Portland Trail Blazers guard Rodney Hood (right) during the first half of an NBA basketball game in Portland, Oregon, on April 7. What have you learned about yourself from everything you have gone through … to making your season debut with Denver on Feb. 13? I worked very hard to get back, and that was a special day for me, overall, just ’cause all the work I put in after surgery, seven straight months of two-a-days. People just don’t know about that. That thing was tough. The surgery was tough. It says a lot about yourself. A lot about yourself comes out when you have to sit that long, and it’s something that you learn. I never take this game for granted, I never took it for granted, and it just makes me cherish it that much more. How did you mentally get through your injury? Did anyone help you get through it? My kids, my family, and looking at them every day. Coming home from rehab, before I go to rehab. My kids would say, ‘When are you going to play again?’ They always asked that. That was inspiration. That was motivation for me to keep going. I had a lot of down days where I wanted to give up because I’m human at the end of the day and I have been through a lot the last two years. Oh, hell no. I’m playing until I’m 40. … I want to play until I can’t no more. I’m good, I’m good. All I know is to keep going. And I know, like I keep saying, if I ever get the opportunity again, I’m running back up and they won’t be able to take it from me this time. Did you seriously consider retiring while you were out with the hip injury? Oh, hell no. I’m playing until I’m 40. … I want to play until I can’t no more. For sure. While you were sidelined, did you contemplate what you might do after basketball? Not yet. I obviously want to be something, a part of basketball, when I do retire, but I got so much more in my career to look forward to and I never think that way. I know you were friends with rapper Nipsey Hussle. Is there anything you can share about your love for your friend? He meant everything to me. That’s one of my close friends. It feels like our careers went to the top at the same time. He started in ’08, when I was in college, and then him just coming out with ‘The Marathon’ and going at his pace, he meant everything to me. I will forever grind for him and try to keep this marathon life going. That s— hit home. What do you hope people will learn from Nipsey’s lyrics and life? He was one of the most positive guys I’ve ever met. Know he’s been through it, with his life. So I think that’s the biggest thing I’m going to take from him is to continue to grind and stay as positive as possible and have that real genuine love for everybody. What do you tell kids who are aspiring basketball players but who are undersized? Just to keep going. Don’t ever let anybody tell you you can’t be what you want to be. I’m a prime example of that. But before that, [Allen] Iverson and those guys were an example for me. So when I got to the stage and took it to the top like I did, that made me realize so many people are watching every move that I make. And when I got hurt and people treated me the way they did and turned on me and didn’t give me that chance, people were still looking at me to keep going. I know my career and my story is an inspiration to all kids and the next generation, so that’s one thing that keeps me going. Knowing that if I quit — probably the easy thing to do is quit and give up — if I do that, I know the next person will, and I don’t want that to happen. Do you think you’re the greatest player under 5-10? For sure. Ever. Ever. Because nobody’s done what I done. My career averages, what I’ve done, with given the circumstances I’ve been in, nobody’s done that.